Working my way up the southern cone, here is the Balanço Energético Nacional 2014 for Brazil. Found this on the webpage of Curitiba based consulting firm ACV Brasil. The national energy balances for Brazil are published annually by the Ministério de Minas e Energia (MME), and newer reports are available (PDF for 2018, large!). 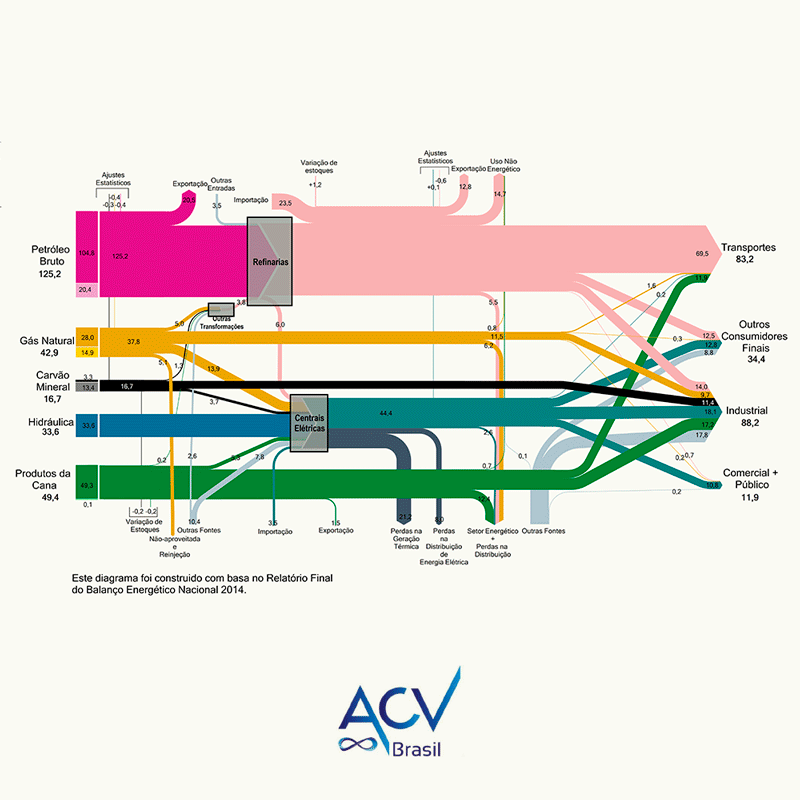 However, the energy flows diagrams in these official reports are less refined, so I opted to go with the remake by ACV. The unit of flow is not shown, but my guess is that it is Mtep. like in the original publication. Working my way up the southern cone, next in the mini-series on national energy balances for countries in Latin America is the one for Argentina‘s neighbor: Uruguay. The Ministerio de Industria, Energía y Minería (MIEM) is publishing the Balance Energetico Nacional (BEN) for Uruguay and there is a dedicated website with all the underlying data. 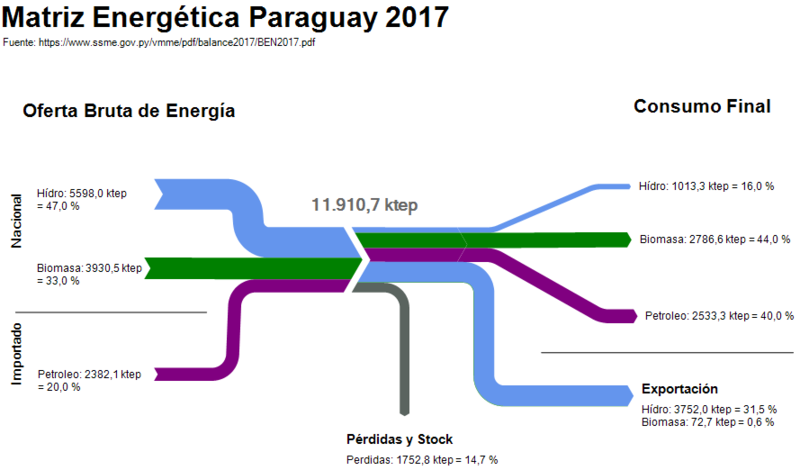 The flow diagram (diagrama de flujo) for the 2015 energy balance was produced by engineering and energy consultancy SEG Ingenieria from Montevideo and appeared in their technical file on energy indicators (Nov 2016, in Spanish only). Flows are in ktoe (Spanish: ktep, kilo tonelada equivalente de petróleo). The country-wide final consumption in 2015 was 4399 ktoe. The round icons visualize sources, energy conversion and consuming sectors. 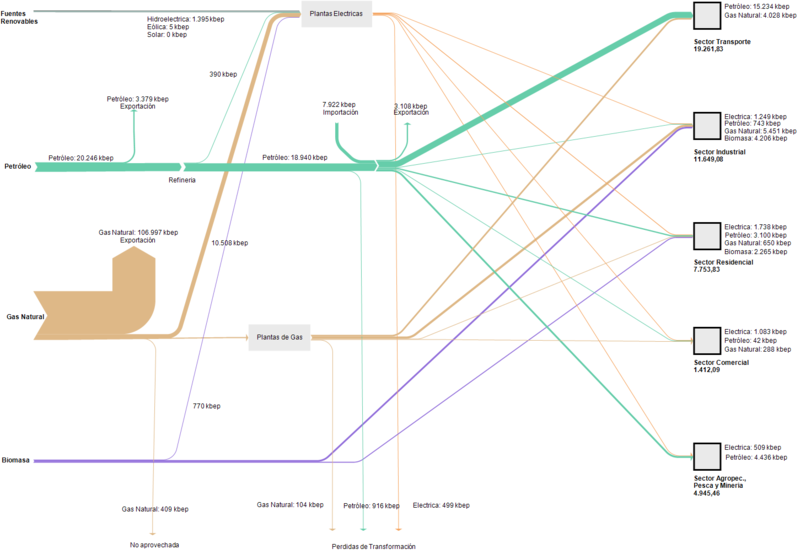 They look nice and playful, however, they might also dissimulate the flow quantities: For example, if you look at ‘Transporte’ and ‘Industria’ in the right-hand side, they do have the same diameter, but transport has a 28% share of the final consumption while industry has 42%. Recently I have been reading about energy policies in Latin American countries. Quito-based OLADE, the inter-governmental Organización Latinoamericana de Energía plays a key role in coordination and cooperation between countries in regard to energy. OLADE has also established the SIER (Sistema de Información Energética Regional), and one of their products is SieLAC (Sistema de Información Energética de Latinoamérica Latina y el Caribe) where energy data for 27 countries can be accessed. 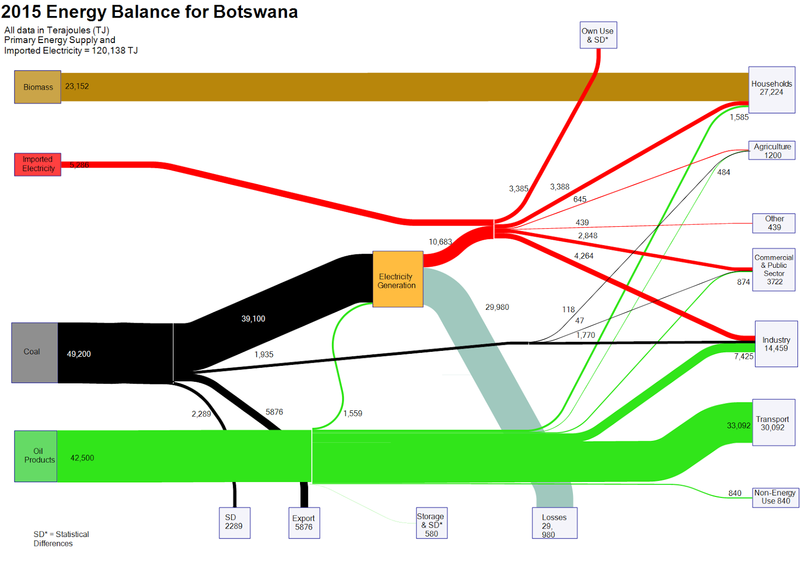 For all countries the national energy balance (Balance Energético Nacional, BEN) can be produced as Sankey diagrams for the years 2005 through to 2010. Further, these energy flows can also be shown for regions, such as the Caribbean, the Andean countries or the “Southern Cone”. Here is the one for Argentina in 2010. To try for yourself, just go to the sieLAC page and click on ‘Balance Energético Resumido’. Then select country, year and the unit. Unfortunately, data for more recent years is not available at this time. This work of OLADE has inspired me to start a loose mini-series of posts titled ‘LatAm BEN’ where I will be showing Sankey diagrams representing national energy balances from the region. Don’t worry, they will not all be from SieLAC, and will show how differently BENs can look like.